The magic of romance wings its way to Kath Libbert Jewellery Gallery where a sparkling array of exquisite tokens of love can be found in time for Valentines Day. The occasion? The Alternative Wedding Show, Yorkshire’s largest and most distinctive annual selling exhibition of contemporary bridal jewellery. Now celebrating its twelth year, The Alternative Wedding Show is renowned for featuring jewellery by cutting edge designers including jeweller to the stars Malcolm Morris, who has made beautiful original pieces for the Duchess of Gloucester, Joan Collins and Dawn French. Morris also created the tiaras worn by Gwyneth Paltrow in Shakespeare in Love and by Amy Adams in The Wedding Date. In 2002 he was commissioned to create a contemporary tiara to commemorate Her Majesty the Queen’s Golden Jubilee. 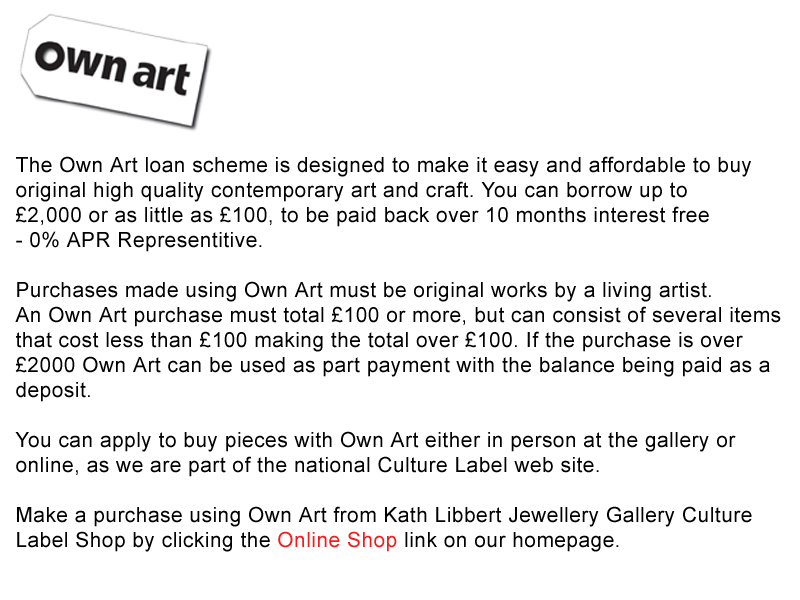 Kath Libbert Jewellery Gallery has been based at Salts Mill (home to the world’s largest collection of Hockney artworks) since 1996. The gallery is renowned for showcasing the work of internationally celebrated jewellery designers alongside that of emerging talent, and also holds a strong reputation for its bespoke jewellery design service. A personalised design service is a strong feature of this year’s Alternative Wedding Show, and Kath Libbert Jewellery Gallery is addressing the current trend for working heirloom jewels into contemporary designs by specially featuring jewellers who will work to commission and create bespoke pieces for the gallery’s clients. 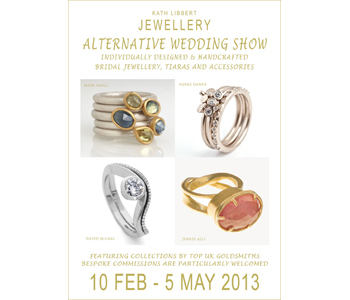 As part of The Alternative Wedding Show 2013, Kath Libbert Jewellery Gallery will hold an exclusive afternoon event on Sunday 10th Feb. Some of the UK's most prestigious jewellers will be attending, providing a great opportunity to explore your ideas for individual commissions for engagement rings, wedding rings and tiaras, which can even incorporate stones from your own heirloom pieces. Bubbly and canapés will be served! Please contact the gallery for an invitation. 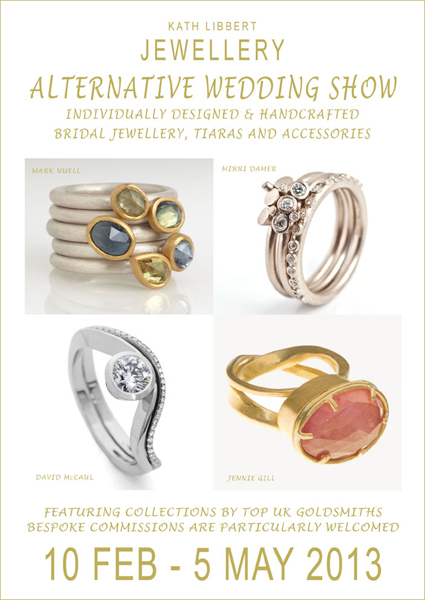 Artists featured in 'Alternative Wedding Show 2013' are: Mark Nuell; Mirri Damer; David McCaul; Natalie Jane Harris; Jennie Gill; James Newman; Poppy Dandiya; Malcolm Morris; Graeme McColm; Jacqueline Mina; Maria Frantzi; Victoria Walker; Tanja Ufer; Jo Hayes-Ward; Mikala Djorup; Jacks Design; Catherine Mannheim; Josef Koppmann; Maneggi; Chris Boland; Diana Porter; Shona Carnegie; Kate Smith; Iain Henderson; Michael Carberry; Sara Bukumunhe; Nicola Perkins; Sarah Lawrence. A selection of tiaras also available.